H.E. Yahya bin Said bin Abdullah al-Jabri, Board Chairman of the Special Economic Zone Authority at Duqm (SEZAD), received, today (Wednesday 30 March 2016), H.E. 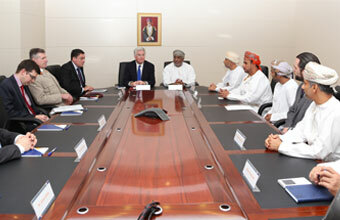 Michael Fallon, British Defence Secretary, and the accompanying delegation visiting the Sultanate currently. Bilateral relations between the Sultanate and Britain, and issues of mutual interest for the two friendly countries, have been reviewed during the meeting. In addition, the role that could be played by such cordial visits in promoting the collaboration between the two countries has also been considered. During the meeting, H.E. Yahya bin Said bin Abdullah al-Jabri briefed the visiting guest about the potentialities of the Special Economic Zone at Duqm, the features it enjoys, and the incentives provided by the SEZAD for investors and projects that are currently being carried out in the Zone. Al-Jabri emphasized that the Sultanate welcomes the British investments in the SEZAD. He praised the collaboration between the companies operating at the SEZAD and the British companies. SEZAD Chairman explained that the zone is distinguished by its diverse investment opportunities available for investors. He hailed the local and international attention enjoyed by the zone. For his part, H.E. Michael Fallon, British Defence Secretary, hailed the growth and prosperity witnessed by the Sultanate in the modern Renaissance Age. He expressed his hope in promoting the collaboration between the two countries.